I wish I could explain why so many Americans dig hard-shell tacos. Don’t be a snob. You know what I’m talking about. Taco Bell (born in California in 1962) was the first “Mexican” food many Americans tasted. And some of us looked forward to the nights our moms fixed tacos from a kit, seasoning hamburger meat with a packet of spice mix and letting us customize our own greasy crunch bombs at the table. This is why, on my first visit to Taco Pete in East Point, a certain friend told me the hard-shell beef taco is her “litmus test” at a joint like this. It’s what she grew up eating at Jalisco in Buckhead, what New York Times food editor Sam Sifton calls “middle-school tacos,” and it’s the first thing you see on the menu at Taco Pete, founded 12 years ago in a minuscule, 270-square-foot spot by Los Angeles transplant Reo Pagan Jr. and his wife, Claudia. Wrapped in paper and stuffed into a bag, it’s a delicious, nostalgia-dripping $1.75 hard-shell taco, indeed. It is meant to be devoured on the spot, perhaps at one of the picnic tables beside this Southside walk-up. Or ordered by the half-dozen, zipped home and scarfed down with a cold beer, possibly in the company of friends you just retrieved from the airport. 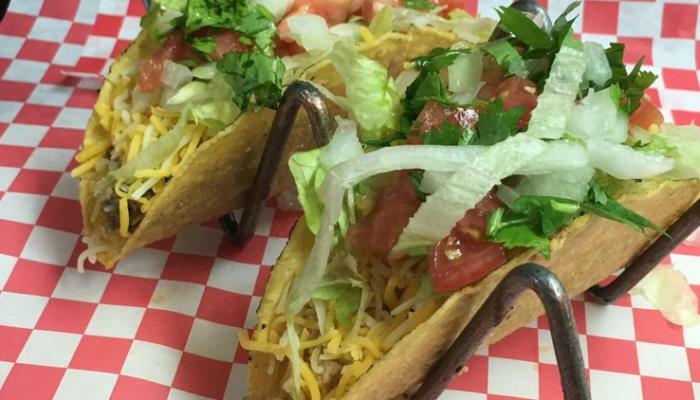 Taco Pete’s soft-shell tacos, quesadillas, and hot dogs are delicious, too, especially when compared to the slap-dash fast-food options that are the norm. Why’s that? I think it’s the cooking technique that makes the difference. Here, soft tortillas and buns are “grilled” to order on a scorching hot flattop (just like the weenies and hamburger patties), then carefully dressed with fillings, fresh toppings, and house-made condiments. Our chili-cheese dog was a smashup of gooey goodness and a gently charred all-beef link, all encased in that delicately toasted bun. An all-American icon, frankly. Not being much of a wheat-tortilla kinda guy, I generally tend to find quesadillas and even burritos rather blah and uninteresting, unless the fillings are stellar. For the most part, that’s the case here. Taco Pete’s “stuffed” quesadilla, filled with all of the above plus your choice of meat, was wonderful. Sliced into wedges and served with hot sauce and sour cream on the side for dipping, it’s a nice thing to share. For our beef combo burrito, we chose potatoes instead of beans or rice. The results were tasty in a meat-and-gravy kind of way. If you like to gnaw on chicken wings, the ones served here are worth considering. We liked the lemon-pepper and (assertively prickly) “hot” versions and appreciated the kitchen letting us split our order so we could try both. Some things at Taco Pete can be uneven, though. We had poor luck with a classic cheeseburger. It was dry, blackened, worth only a nibble or two. French fries were cold, mealy, horrible. When I called Pagan for a quick phone chat, he shared the history of his family business. Seems the original Taco Pete was started by his late father, Reo Sr., in Los Angeles in 1966. By the time Reo Sr. retired and moved to Atlanta in 1989, he had four L.A. locations. Reo Jr. says his dad told him to hold on to the family’s famous beef-filling recipe, that it was like money in the bank. Sure enough, he opened his own spot, a yellow building with a red awning, wedged into the tip of a busy traffic triangle, in 2005. It’s an eye-catcher. Based on the crowds lining up for his cheap, filling American and Mexi-Cali classics, I’d say his old man was right. I think Taco Pete would be a welcome addition to any neighborhood. I just wish to holy hard-shell taco it were in mine.